Two things have come out of this. 1. My husband always eats everything I cook and though I think it’s too dry or too sweet or just not right, he always says, “I think it’s good,” as he stuffs it in his mouth—-giving me amazing amounts of confidence to try again. 2. I feel like a real cook because I’m A) IN the kitchen and B) experimenting. I never would have tried making my own muffins or bread if it weren’t for Sue. I met and worked with Sue in Washington D.C. She made homemade everything, like it was normal. In my house growing up, casseroles were homemade, but anything that could be bought rather than made–probably was. My mother wasn’t/isn’t a fan of the kitchen. I still love her. Sue brought in stunning whole wheat blueberry muffins tasty enough she could have sold them from her desk. She made her own pizza with wheat crust and pulled it out at lunch. I’d always equated baking something that actually tasted good with either being Martha Stewart or Betty Crocker. But not me. Sue said it was easy, gave me the recipe, and invited me over to her house to make them together. And then, a magical thing happened. I made them all the time and they always turned out! AND they tasted good. So I started trying different recipes. New ones. Different ones. Branching out. 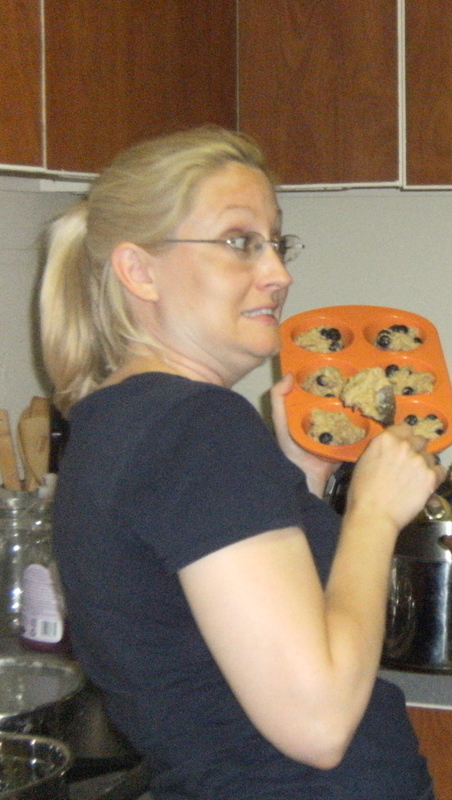 First attempt at homemade muffins in 2008. Unsure of myself, obviously. It’s amazing how one person can introduce you to something and it changes your entire outlook. You’re never the same. Sue showed me that I could. And my wonderful husband continues to give me the confidence to keep trying. If it weren’t for the two of them…I’d still be buying bread and muffins. So a big thank you to Sue for introducing me to what I could do and to my husband who encourages me to keep trying, even when I fail. Not 100% sure what I did wrong……besides not following the directions….exactly. Filled the oiled muffin cups, and baked for 14 minutes. Though the prunes helped with moisture, the muffins turned out so dry, we couldn’t eat them without a full glass of milk per muffin. I think I should have stuck with the buttermilk rather than the 2% and could have used either a little less muffin mix or a little more dried fruit. They were a healthy alternative for breakfast, but the recipe must be tweaked! But you know us and our zero waste policy. Tell me your favorite muffin recipe! 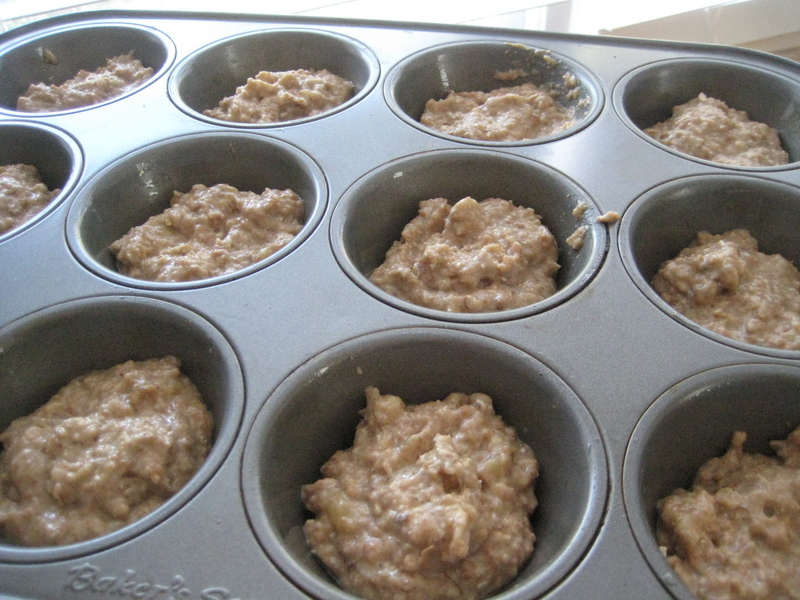 This entry was posted in Food, Making your own food and tagged experiments gone awry in the kitchen, military lifestyle, military spouse, militaryzerowaste, Muffin, prune and walnut whole wheat/oat muffins, zero waste. Bookmark the permalink. I am not really into cooking..those days are long gone..now its just food. Baking is soooo not my thing!! Hopefully that will change with the new kitchen design (including replacing a non-functional oven). I’ve always wanted to bake with my kids, but have had neither the kitchen space nor the counter space. I screw things up all the time. Husband always eats them, even when I won’t. Love when they do that! I’ve learned never to replace with a low-fat or no-fat milk if a recipe doesn’t specifically call for it., especially with whole wheat flour. In a pinch, I will put some vinegar into soy or nut milk to sit and curdle while I mix up everything else — not failed me. We have several egg replacer tricks too. You can also try a cup of shredded granny smith apple to moisten a bit more. It’s tricky when you try to replace 100% of the sugar in a recipe. They turned out dry because, technically, sugar is part of the liquid component of the recipe. Next time, instead of stevia or Splenda, try replacing some sugar with applesauce or pineapple purée. only one word to delete from your post–one to remove from your memory- one to erase from your mind–that is the erroneous name–FAILURE..
suddenly you are perceiving adventure in gastronomy, experience in cooking, savor in gustatory experiment..and we are your hungry audience. you never fail, you are inventing novel textures, unusual appearance and keeping your relationships to friends and husband so fresh and flexible. you are our amicable genie. leslie, great advice also raw sugar or sorghum or honey. in low quantity. And they sounded so promising! I’m glad you feel ok to share your failures online, makes you all that more human! I recently posted a brownie recipe – super unhealthy, but they always work, if you want to give them a try?! Thank you so much everyone for your encouragement and tips. Nadine, thank you for reminding me not to use the word failure when I cook! Sarah—some unhealthy, fool-proof brownies sound divine!